Attending a comic-con is already a fun activity in its own right. However, that doesn’t mean that you and your friends can’t heighten the amount of fun you have at Comic-Con! If you want to do something quirky and amusing during the event, read on! All you need to do to play Comic-Con Bingo is get a modified bingo card. No bingo balls are needed. To play the game, just download a blank bingo card from Print Bingo. The number of cards will depend on how many players will participate. Each player needs to have one. Once you’ve obtained the blank cards, you must write on the blank spaces “descriptions” of people who attend Comic-Con. Check out the post written by Dorkly titled “Fifteen People You’ll See At Every Nerd Convention.” Write on the spaces things like “Person playing Pokemon Go” or “A person cosplaying as Naruto” and daub them whenever you see a similar situation at the actual event. To avoid cheating, each player must take a photo of the situations they see and present them as evidence at the end of the game. The first person that daubs every slot on his or her card, or finishes a bingo pattern that everyone had agreed upon, wins the game! Bingo has, in the past few years, become a popular pastime not only in the U.S. but Europe as well. According to Gambling Insider, the UK bingo industry has grown significantly into a £400 million industry, with Gala Bingo – one of the biggest online gaming providers in the region and provider of a new breed of online titles like Metropolis and Deal or No Deal Bingo – spearheading the industry and widening its reach by merging with another leading gaming company. Apart from bingo being actively played in gaming halls and online sites, it is also being used as a recreational activity for fundraisers, thus, we feel it’s a great fit for comic con. Don’t forget to give an award to the person who wins Comic-Con Bingo! It doesn’t have to be an expensive gift. Just make sure it’s a prize that everyone desires to make the game more interesting for everyone. This entry was posted on July 22, 2016 by GeekOut Team. 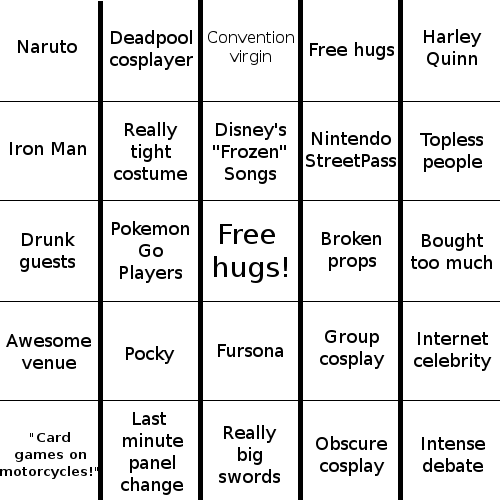 It was filed under GeekOut discussion, Guest Post and was tagged with Bingo, Bingo Game, Comic Con, Dorkly, Fun Things To Do At Comic-Con, Gala Bingo, Games To Play At Comic-Con, Geek Bingo, Geeks, Pokemon Go, UK Bingo.